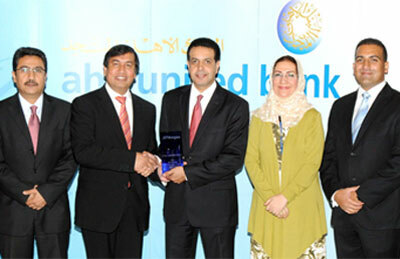 Bahrain-based Ahli United Bank (AUB) has been awarded the Elite Quality Recognition Award 2012 by JPMorgan Chase Bank for its outstanding performance in processing funds in US dollars for the eighth year in a row. Since 1997, JPMorgan Chase has been giving this award to acknowledge the consistent, high-quality performance of clients' payments processing. This year, less than one per cent of its funds transfer clients qualified for the Quality Recognition Award. The award is divided into two groups, each designated by a Swift message type (MT). Within each group, there is an elite award category given to recognise the ultimate level of performance. AUB qualified for the Elite title for both categories of payments, having achieved straight through processing (STP) rate of 99.7 per cent for Swift message type MT103 and 99.89pc for Swift message type MT202. This achievement is regionally and internationally among the highest rates in the industry. Officials of JPMorgan Chase formally presented the award to AUB deputy group chief executive operations and technology Shafqat Anwar at a special ceremony at AUB's headquarters in Seef. "We are proud to recognise AUB's achievement in continuing to exceed our stringent STP performance standards and qualifying for the Elite Quality Recognition Award for the eighth consecutive year in both payment categories," said JPMorgan Chase head of MEA region Ali Moosa. "This award is a tribute to AUB's long-standing commitment to quality in its operations," he added. After receiving the award, Anwar said, "It is gratifying to once again receive this prestigious award, which highlights the bank's consistently superior efficiency in its customer funds transfer, treasury and trade finance payments."